2005 Tiffin Allegra Class-A Motorhome. Newly renovated MH, including all new flooring and window coverings, all new batteries, new alternator and new hydraulic pump and has the same options as most MHs. This MH has been well maintained; it is ready to hit the road....no repairs needed. 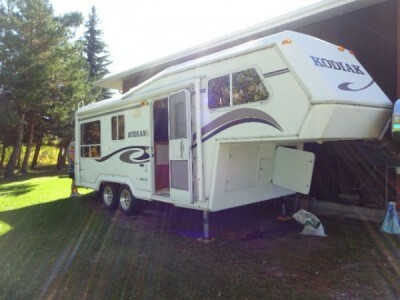 The inside is in excellent shape and once the four slide outs are out, it is very spacious. Please call 250-838-2621 to view. 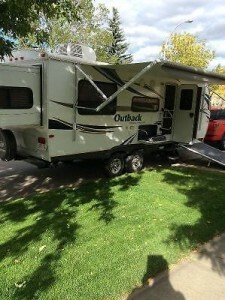 2008 Forest River Silverback 33LRLBS Fifthwheel. Looking for a home away from home? Luxurious, spacious and in excellent condition, and has had very little use. This unit has a fireplace with recliners to watch TV, day night shades, 2 fantastic fans, built in vacuum, awnings over the popouts. The main awning has never been used (new). The bedroom and bathroom is very large and the shower has a small tub as a base and is roomy. Price reduced to $21,995.00 or best offer. 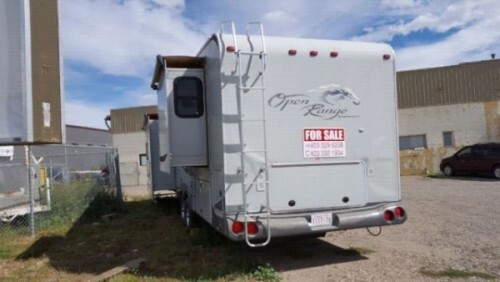 Please call or text @ 780-860-3616 if you would like more information, more pictures or arrange to view the trailer. 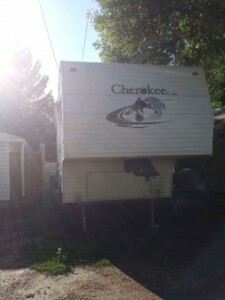 2006 Forest River Cherokee 255 Trailer is in good condition. 9 out of 10 for its age and very easy to tow. Hardly used. Less than 10 times but unfortunately has been smoked in. Sleeps 6 to 8 people. Perfect for hunting. Has 1 slide. Moving to New Brunswick and cannot take trailer. No reasonable offer will be refused but am not giving it away. Reduced from $25,000. Please call 780-802-3476 to book an appointment for viewing. 2012 Crossroads Cruiser Trailer. 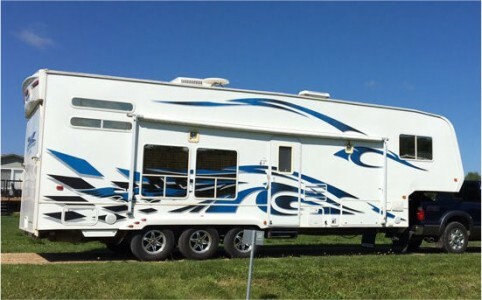 This beautiful 2012 travel trailer is a must see. It is in showroom condition. This trailer has no damages and is in perfect shape. Pictures cannot do it justice. The fridge has been completely rebuilt under warranty as well as the furnace. This trailer has updated polar tec package (rated for 20 to 25 below). It is 1/2 ton towable and is very easy to tow. Sleeps 12 people peacefully. Excellent for hunting and camping. Equipped with an outside kitchen and rear access BBQ. Tires and brakes are almost new (original). Please call 780-802-3476 to arrange a viewing. Full financing available. 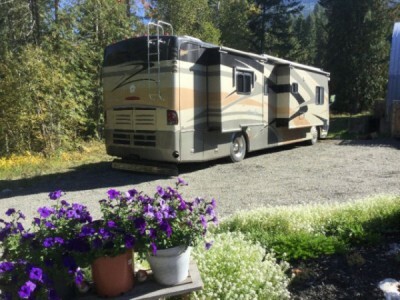 Beautiful 5th Wheel RV, well cared for, and is in immaculate condition. Used only 3 summers - Stored indoors winter months - Smoke Free- Less than 1,200km on tires and running gear - towed with a 2011 GMC 2500 Diesel with ease. Black Water Capacity 50 gals. Please call 403-627-8907 to view. 2014 Forest River XLR Thunderbolt Fifthwheel. 38 Foot with 12 foot garage + 6 - 5000 lb tie downs, 2 electric queen beds and heated and air conditioned. 5500 watt Onan generator with 38 hours on it, 2 fuel stations,heated tanks,dual pane windows winter package and 7000 lb axles. Ramp turns into a party deck, W&D prep hook-up in garage. Cordless Dyson vac. Hydraulic front jacks and 2 slide out's,Transferable 3 year extended warranty.To much to list. We did not use this year at all, still winterized from 2015. We can no longer use. Private sale so no GST. $58,500.00 OBO. Located 20 minutes North of Clyde off Hwy 2. Call Glen at 780-707-8908 to view. 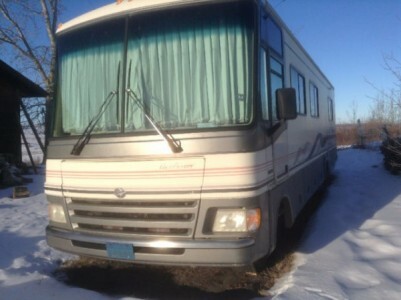 1996 Fleetwood Pacearrow 38Ft Class-A Motorhome. Great condition new winsheild, new rear brakes, Ford Chassis with a 460 V8. 2 AC units, Onan generator. Please call 403-938-2014 to view. 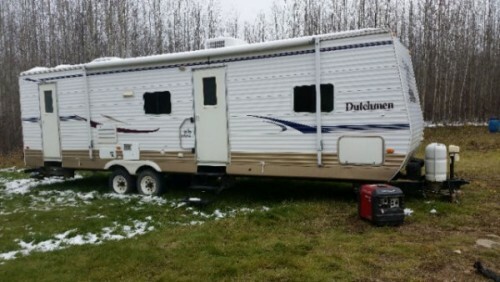 2007 Dutchmen Classic Series 305DSL Trailer. 2 slide outs, TV, DVD. surround. air comes with honda 3000 generator. Please call 780-404-7793 to view. 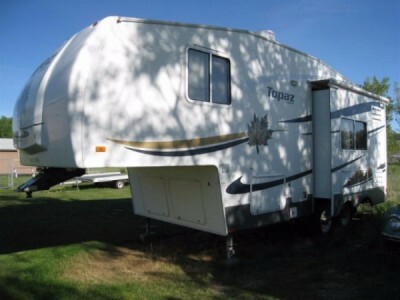 2008 Crossroads Zinger ZT32QB Trailer. This trailer comes fully equipped with dishes, bedding, silverware, cups, 4 brand new tires, appliances have only been used 6 times since we bought in 4 months ago. It has two doors, one at the front and one at the very back of the trailer. It has 2 push outs. 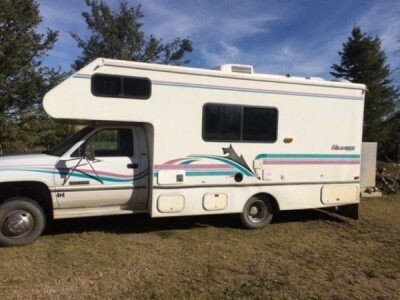 It has 2 bedrooms and sleeps up to 8 people. The front bedroom has a queen bed with loads of closet space. The back bedroom comes with bunk beds, double bed on bottom which converts to 2nd couch and top bunk is single. Full bathroom with tub and shower. Awning is in excellent condition. It also comes with BBQ and coleman stove, chairs, tables and outdoor very large mat. Also included are the 2 tv's new sewer hose, 2 30lb propane tanks. Please call 780-916-5044 to view. 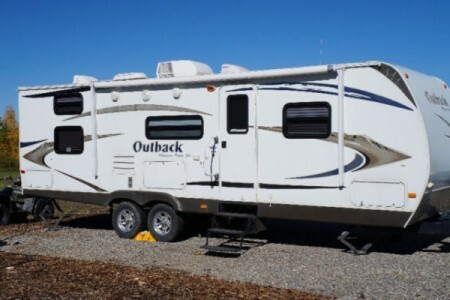 2010 Keystone Outback 270BH Trailer. This trailer is amazing! One of the better built units out there with all aluminum frame walls, it weighs under 6,000lbs! It is in like new condition with many extra options and is in mint condition. 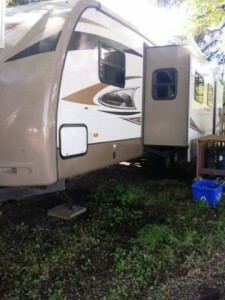 Has room to sleep 8, lots of storage, outdoor shower and stove, 2-35 lb propane tanks, 2 brand new batteries, solar panels, max air vents, new pump, tarp over huge bump out, cream upper cabinets, A/C, stove , microwave, fridge, freezer, TV/DVD, stereo, power awning, 3-1/2 season insulation. Wheel bearings were repacked last season and we can take care of this winters storage! This has been an absolutely wonderful trailer for our family and know that it has years of enjoyment for another special family! Please call 403-589-6614 to view. 2005 Bombardier Snowking 19ft + 2 SLEDs. Boss seat, can, 2 after market wraps, after market boards, Showa - Marzocchi shocks. Very nice fun sled. 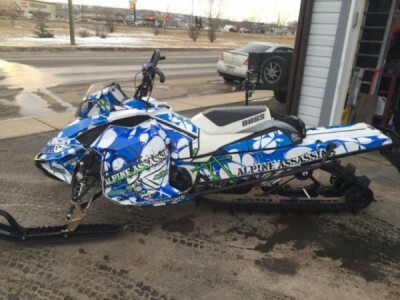 2004 800 Rev - 159" Boss seat, can, after market snow eliminator boards, Simmon skis, very low km on new engine. Sled has NOS but I have not hooked it up to newer engine. Nice looking sled. 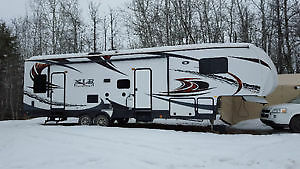 2005 - Snow king sled trailer. Tool box and cabinets, stereo, dual batteries wired with charger to charge when plugged in, propane heater, helmet racks, clothing racks, super glide runners, super clamps for tie downs, fuel jug holders, linex flooring done professionally cost $2100.00. Awesome 2 place trailer. 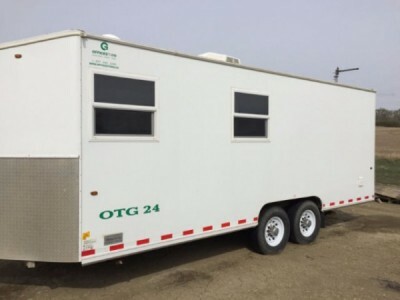 2012 OTG Office Trailer 24ft Trailer. Excellent condition. Low miles. Please call 403-650-9151 to view. Contact for more details, for a copy of the spec sheet, or to see the trailer in real life! Please call 403-243-7740 to view. 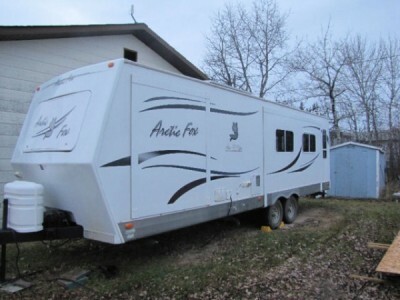 2007 Arctic Fox Silver Fox Edition 30U Trailer. Selling it because our family has grown and it no long accommodates us. 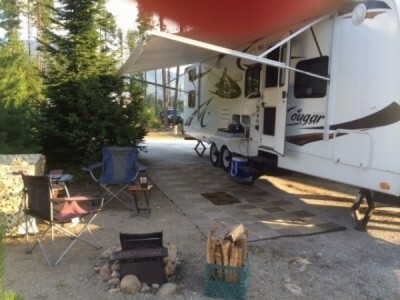 Trailer is 4 seasons so perfect for anyone who loves camping in the late fall or needs for work all winter long. Comes with skirting, solar panels, satellite. Other features are free standing dinette, extra large oven, picture window and with rocking loungers. Queen size bed and couch pulls out to double bed as well. Please call Joe-Ann @ 780-573-5620 to view. 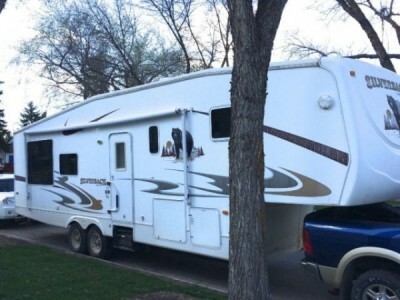 2006 Cedar Creek Silverback 34Ft Fifthwheel. Perfect for Snowbirds the unit is in excellent condition a must see. Please call 587-597-9344 to view. 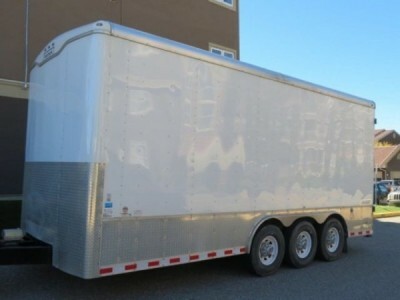 2012 Gulfstream Gulfbreeze 26RBK Trailer. Sleeps 6. Rear outside kitchen. Excellent shape. Located in Enchant AB. Willing to meet somewhere to pick it up. Please text or call Rich @ 403-394-5309. 2006 Forest River Cherokee Wolfpack Toy Hauler. 30ft bumper pull. Is in excellent condition, very well taken care of. Is an open floor plan. Table and seats and bunk bed fold up and gives you 12ft of garage space. Large water tank, on board fuel station, full bathroom with large tub/shower, 2 tv`s, stereo, air conditioning, microwave, large fridge and many more. Serious inquires. Please call 403-563-0415 or 403-563-4067 for more info. 1996 Serro Scotty Hilander Class-C Motorhome. 5.9 12 valve cummins, awesome on fuel. 4x4. Was auto but converted to 5 speed manual. Onan 4000 propane generator. Whole new roof this year. Solar panels so you don't have to plug it in to charge batteries. Big custom aluminum storage box on back. Please call 780-910-9050 to view. 2008 Triple E Touring Edition Fifthwheel. F251SS XL 5th Wheel 27 Ft. Canadian Built Quality, Recent 150 Watt Solar Panel, 6 Volt Golf Cart Batteries, Recent Converter/ Charger / Inverter, 16 Inch Alloy Wheels, Large Basement Storage with Aluminum Slide Out Tray, Ducted Heat and Air Conditioning, Awning, Large Fridge, All Season Package, 1/2 Ton Towable. GVWR 8990 Lbs Very Good Condition. Please call 403-770-2834 to view. 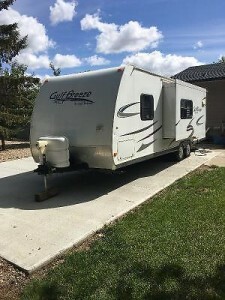 2009 Keystone Cougar 316QBS Fifthwheel. 3 slides, kids bunk room sleeps 5. Sleeps 8 total. Large master suite with queen bed.large sectional couch with 2 tables perfect layout for family. It has 3 solar panels / polar package. Please call 780-893-6238. 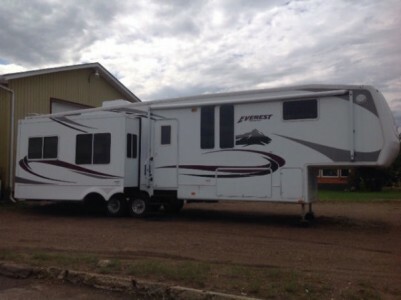 2010 Open Range Journeyer 340FLR Trailer. 3 slide out electric awning piped in for washer and dryer new water pump new converter large front window large bedroom 2 new batteries. Please call 403-332-1934 to view. 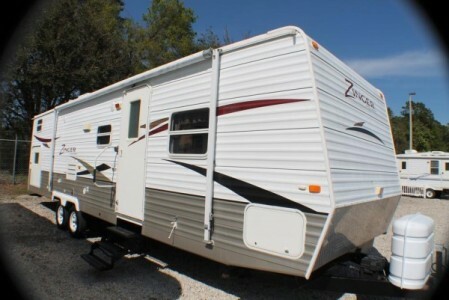 2010 Jayco Designer 35RLTS Fifthwheel. Like brand new, stored inside year round, used 6 times overall lengh 38.6ft full king sized bed. Please call 604-761-5577 to view. 2007 Weekend Warrior LE3105 Toy Hauler. 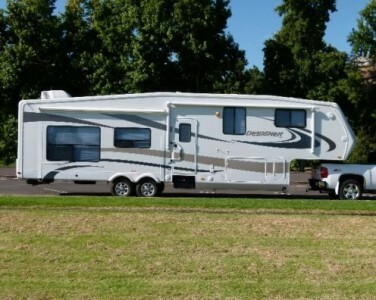 This toy hauler has been great for us, but we want to move on to a motorhome. Easily sleeps 8. We have hauled the following units in it: Kawasaki Teryx 4 800, 2014 RZR 1000, 2012 Can Am Commander and a John Deere SXS. 12ft-4in Garage (Room for 1 SXS or 2 Quads). Solar Package with 2 NEW Gel Batteries. Onan Generator. On-board fuel cell. Indoor/outdoor speakers with Zone controls. Exterior propane connection for BBQ. Maintenance completed this season: All axle seals, bearings and brakes inspected and repaired/replaced as required. Outdoor speakers and grills replaced. New this season: Solar Panel Package - bought/installed from Woodys RV. 2 x 12V RV Gel batteries with warranty (Canadian Tire - $360 each). All 6 tires and rims replaced, brand new. 2 x Max Fans (with remotes) installed - Outback Country RV Sherwood Park. Please call 780-991-0871 to view. 2013 Keystone Outback 230RS Trailer. 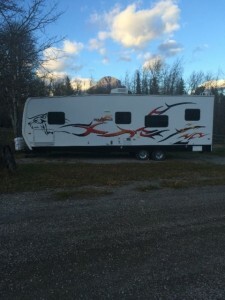 Toy Hauler has never hauled or stored any "Toys". Bunk beds. Rear king slide. Outdoor kitchen with stove and sink. 5360lbs. Half ton towable. 2 x 30lbs propane tank. Rear exterior storage. Call or text 780-915-6878 to come take a look! 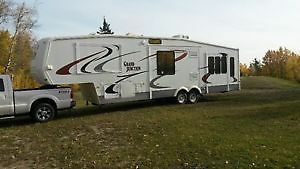 2006 Dutchmen Grand Junction 37TSL Fifthwheel. 4 slides. Currently located in Edmonton, Alberta. Large kitchen with dinette, Loads of cupboard and counter space. Rear living room with double rocker and pull out love seat. A/C. Awning. Lots of cargo storage. Electric jacks. Non smoking. Purchased new in 2007. One family owners. Sleeps 4. Low mileage. Partial trades considered. Vendor financing. The Original Story. A Grand Junction Difference. Distinctive Style. First-class elegance. Unsurpassed Value. Quad slide, sunken lounge. enormous kitchen with solid countertops. Entertainment centre and desk slide in sunken living area. French doors into sunken living area. Isolated rear family room/2nd bedroom. Overside bedroom suite. Please call 306-955-0684 to view. 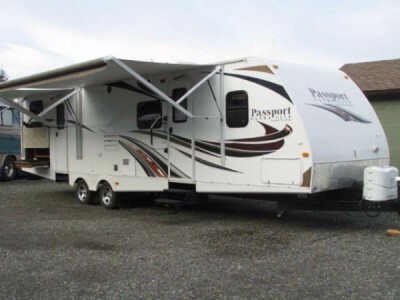 2013 Keystone Passport 320BHWE Trailer. Full queen pillow top mattress in front bedroom. The trailer sleeps 10 in total, has 2 power slides, 2 power awnings and a large rear bunkhouse. There is lots of storage and a dedicated food pantry. The outdoor kitchen has a fridge, sink and cook top. The unit comes with many accessories, ready to go camping. Upgraded axles, springs and new tires. New dual 6V batteries, full LED lighting in/out. Weighs under 7,000lbs with fresh water, pulls nicely with a half ton truck or large SUV. Comes complete with Reese dual cam weight distribution hitch and tire TPMS system. Please call 403-813-3181 for more info. 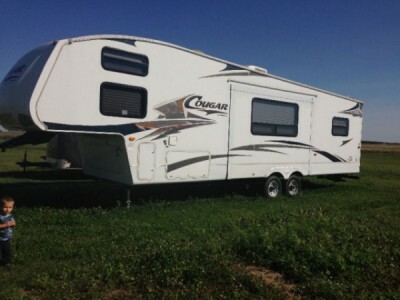 2010 Keystone Cougar Xlite 29BHS Trailer. 4 bunks in back bedroom. Excellent shape. Need to down size. Willing to store this winter. If you want to view please call. Too many options to list. Please call 780-713-1735 to view. 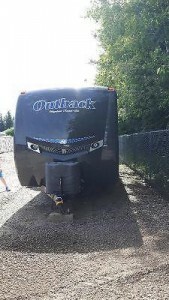 2013 Keystone Outback 29Ft Trailer. 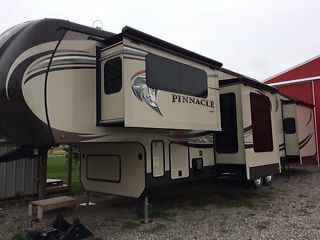 Sleeps 10, bunk beds, queen temperpedic mattress, solar panel, outdoor kitchen, 2 doors one for bathroom, TV, DVD, stereo with outside speakers, comes with hitch and hitch lock, 2 slides, vent covers, slide out awnings, BBQ, leveling blocks, fiber glass front new paint due to fading. Excellent condition used maybe 10 times. Serious inquiries only. Please call 780-728-3859 or 780-712-5592 Home to view. 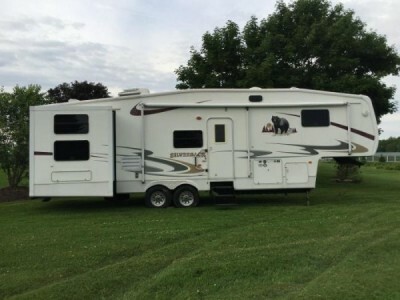 2002 Vanguard Kodiak 22+2VLE Fifthwheel. Winter kit. Storm Windows. Pleated Day-Night shades/window coverings. Solar panel with Plus RV150. 2500W Freedom Inverter. Queen-size bed. Sofa converts to bed. Dining area converts to sleeping area. (sleeps 6). Spare tire secured on front hitch. Aluminum rims. Hitch package & wiring. 15' awning with "Add-a-Room". P.D.I. (2 batteries, 2 propane tanks, sewer hose). "Fan-tastic" vent (rain sensitive)installed over bed area. Upgraded R&R roof vent in washroom. Outside shower. Storage box w/ tubular box holder frame coated with armorthane (fits in hitch). Owner installed storage in washroom. Original owner/like new/non-smokers. Please call 780-953-6236 to view. 2006 Keystone Everest 34Ft Fifthwheel. 4 slides, king bed. Used very little. Chesterfield makes into a bed, smoke and pet free, air conditioned, fantastic fan. Mileage has been pulled approximately 1,000 km. Excellent condition. Call 780-836-5150 for more details.